During the millenial anniversary of Leipzig, its annual book fair and saxony’s summer of architecture, which all take place in Leipzig this spring, we will present a unique project which connects all the mentioned aspects. Here our english speaking readers will find a summary, while they can explore the remaining (german) project website for images, videos or further details. published on 9th march 2015. The Leipziger Ring project developed from a joint idea of the PanoramaStreetline Team and Lehmstedt Verlag (Publishing House). PanoramaStreetline is the largest archive of linear panorama photography worldwide. The Lehmstedt Verlag is based in Leipzig and suggested that a complete panoramic lithography of Leipzigs‘ city circle from ca. 1850 could be repeated with modern photographic technology for Leipzigs‘ 1000 years jubilee in 2015. That was 2 years ago. 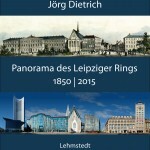 Today the modern panorama of the complete city circle is finnished and we can present this unique comparison of the Leipziger Ring with an exhibition and a book. You are wellcome to discover and enjoy our project, which we will unfold on this website (german area) – a project combining architecture, history, art and photography. On request we gladly produce high quality art prints of sections of the Leipziger Ring, just contact us. Alternatively a selection of street views from Leipzig as well as other cities can be ordered through our shop and amazon. We would like to thank the city of Leipzig and its cultural affairs office as well as Ebner Stolz Leipzig and Spirit Legal for supporting our project. Not only a city’s appearance with its streets and facades is changing in time. Also the techniques for visualization are changing and offering new possibilities with time passing by. There is a huge historical weight with the Leipziger Ring from its beginnings as the cities fortifications in the middle ages up to its role in the monday demonstrations of 1989 which ultimately brought down the Berlin Wall. The Leipziger Ring has always presented representative buildings – from Augustusplatz to the New Town Hall, from the main station to the Blechbüchse, from the Runde Ecke (former Stasi HQ) to St. Thomas church. In the context of the city´s 1000th anniversary PanoramaStreetline and Lehmstedt Verlag have created a very special comparison. In a great panorama-exhibition the city circle 2015 will be contrasted artistically by its own ancestor 165 years ago. A contemporary lithography from ca. 1850 stimulated this form of exhibition. With a very special panoramic technique the photographer Jörg Dietrich realized a modern view of the facades surrounding the inner city of Leipzig. The exhibition takes place from the 13th of march until the 13th of june 2015 in the municipal library. It shows the longest continuous panoramic photography worldwide with the Leipziger Ring measuring about 3.5 km in length. The linear panorama is not the usual 360° one, recognizable by showing remarkable currently unseen perspectives. Technical details, changes in architecture and a lot of more things can be discovered during the opening, on the 13th of march in a lively conversation. The mayor of culture, mister Faber, photographer as well as PanoramaStreetline founder Jörg Dietrich and the publisher of the book, which is published in the context of the exhibiton, Dr. Mark Lehmstedt, will be there to talk with each other and an interested audience. We hope to show a new and unique perspective on the Leipziger Ring, no matter if you are living in Leipzig in 3rd generation, only for while or just visiting. We hope to have attracted your attention and would like to welcome you to visit our exhibition and explore the images and backgrounds presented on this website.